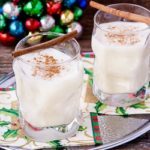 Coconut Eggnog, also known as Coquito, is a rich and creamy holiday drink flavored with coconut, cinnamon, and a touch of nutmeg. Whisk together evaporated milk and egg yolks in a medium saucepan. Cook over medium heat, stirring constantly, until mixture slightly thickens and will coat the back of a spoon (or to about 175°F). Pour into a blender. Add sweetened condensed milk, cinnamon, nutmeg, and coconut extract. Blend on high speed until combined and frothy. Pour half of the mixture into a large bowl. Add coconut milk to blender. Blend on high speed until combined and frothy. Pour into bowl with the rest of the eggnog. Whisk until combined. Place plastic wrap directly on top of eggnog. Chill thoroughly, at least 4 hours or overnight. Whisk mixture then pour into a serving pitcher. Rum, brandy, bourbon or other liquors/liqueurs to stir in as desired. White rum is the traditional addition for an authentic Puerto Rican Coquito. Ground cinnamon for sprinkling on top. Cinnamon sticks to use for cocktail stirrers. Prep time does not include time for chilling prior to serving.